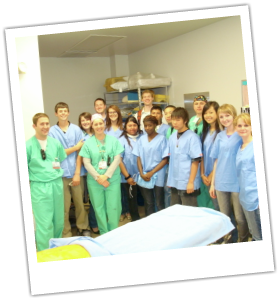 Synopsis: Students at Cordova High School interested in pursuing health professions got a once-in-a-lifetime opportunity when they participated in Jason Christensen and Nick Currlin's Health Professions Exploration project! Students wrote essays explaining their interest in medicine and submitted them to their teachers at Cordova High. Teachers then selected students to participate in a special field trip to UC Davis Medical Center, accompanied by Pediatric Residents Jason and Nick. During the field trip, students learned the newest technology in resucitation, and even got to do a mock code in the Sim Suite with UC Davis Faculty Member, Dr. Melissa Evans. Upon completion of the field trip, students completed a second, reflective essay describing their experience and all that they learned!